Do Standardized Tests Really Measure Students’ Abilities? Students prepare endlessly and relentlessly for standardized tests. The tests measure scholastic readiness and they try to evaluate a student’s standards compared to others in the nation or their area. But, are standardized tests really all they’re cracked up to be? Many people believe there are both pros and cons to standardized testing, although I believe there is one clear opinion. The first type of standardized testing used in the world was in imperial China. They used the results from the tests to determine someone’s eligibility for positions of government. The two main types of standardized testing for high school students today are the SAT and the ACT. The SAT tests students on critical reading, writing, and mathematics. The ACT tests students on English, reading, mathematics, and science. The tests are then sent to colleges to review as major part of acceptance and even scholarship awards. How is testing all of these different animals the same? It is done to students every year. In my opinion, standardized tests do not accurately measure a student’s ability and intelligence. According to Fair Test, students’ individual scores could “vary significantly from day to day due to testing conditions or the test-takers’ mental or emotional state.” This means that students could practice every day, but if on the day of the test they are given bad news, something is going on at home or a friendships is upsetting them, they won’t be in their right state of mind. Also, the questions are the same for each student, which is not fair. Some students may have come form different backgrounds of learning such as what school they go to, what classes they take, or whether or not they are in an honors or AP class. 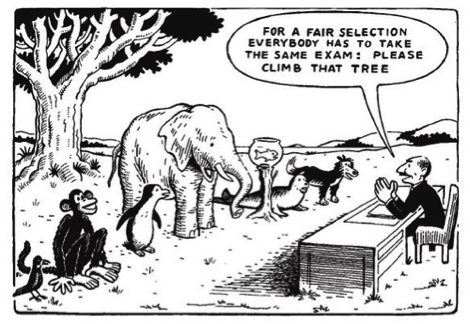 So it is not fair for colleges to assume and judge intelligence based on a student’s scores from standardized tests because everyone learns differently. I don’t think standardized tests are worth all the stress. The sad truth is, we all have to take them whether we like them or not. This might change in the future but for now, we have to accept it. The best and only thing we can do is study hard and make sure we are prepared—oh, and not to let our nerves get the best of us! Homework or Sleep: Which One Takes Priority?